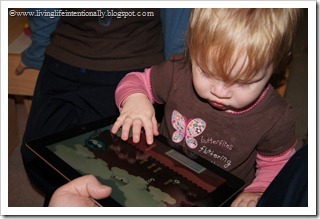 Have you thought about getting a tablet for your house? Have you wondered which one is better? 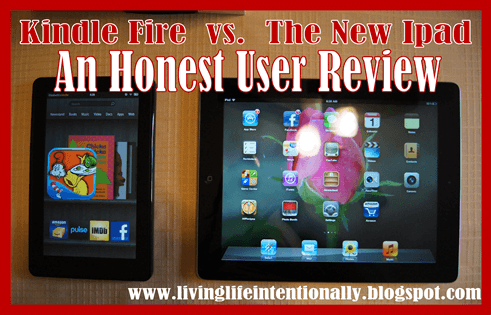 I had the opportunity recently to test out “The New” Ipad and the Kindle Fire and here is what I thought. Bottom line, I think this device was intended as a reader PLUS. The primary purpose of the Fire (in my humble opinion) is to read books. Sure there is a spot for apps (although I couldn’t find 1/2 as many of the educational apps as on the Ipad), you can browse the web, and you can stream movies. That is all the plus part – but it was really designed with reading books in mind. The device itself is half the size of the Ipad – but that didn’t really sway me either way – the 7” screen was plenty big to read a book, play an educational app, or stream a movie. The Fire was easier to hold in my hands – not just because it was smaller, but because it was a little deeper and “sturdier” feel. Hard to explain, but it was very comfortable to sit & read for a long while. The main screen on the Fire is a big tell to what this device is intended for – it is a bookshelf. The apps are on the bottom shelf, much smaller than books. When looking for educational apps (my main purpose in evaluating the tablet) I found not even 1/2 as many educational apps as on the Ipad. Disney’s app books (apps that read as a book, have interactive games, puzzles, stickers, etc.) were not available for android devices. =-( The device is only 8gb with no option to expand. Sure you can stream directly from the Amazon cloud as much as you like, but if you were thinking of using this as a multi purpose DVD player when traveling with your kids you might want to think again. It’s storage will allow you about 5 movies without compromising performance. I also wanted to note that as much as it is handy to be have the Fire connected with your Amazon account, it you don’t download a free app to put parental controls on it – your kids can be purchasing TONS of apps and run up quite a bill. Plus they can access content they probably should not see. With that being said, the main strength to the Fire is the many books available to it. There were several books I wanted that were not available on the Ipad, but were available through Amazon’s kindle library. 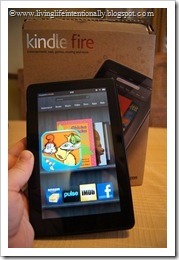 Before you ask, yes there is a kindle device for the Ipad that allows you to read Amazon Kindle books on your Ipad. However, they are not formatted for the Ipad – you WILL notice in children’s books especially that the pictures aren’t lined up right (i.e. not on the same page) and are usually small and hard to see. The kindle Fire is easy to read books with the backlight, clear screen, bookmark, built in dictionary (my hubby’s favorite part) and access to the HUGE Amazon Kindle library. the cord is very short (on both devices) so your charging options are limited. And there is no cord provided to connect it to your computer. 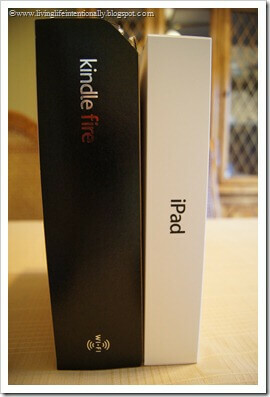 With an 8 hour batter life, the Kindle Fire has about 1/2 the battery life of the Ipad. When browsing and wanting to get back “home” there is no button on the device itself like the Ipad. Yes, there is one that hides on the screen, but I had trouble making it appear more than I liked. There is no easy to control volume on the device – you have to scroll through settings each time you want to adjust it. The power button is in a slightly awkward spot – right next to the head phone jack where your kids might actually shut it off. In case you were all excited (like I was) about the Amazon Prime lending library – read the fine print. You can only check out one book a month! There is no option to return the book early. So if you are reading and adult novel that is perfect, but if you were thinking of using it primarily with your kids you will be disappointed. We have a good library (top 10 in the nation for our size), but the options for digital kids books are still pretty limited. So you will have to drop $13 a book to stock your digital library. I will also note that there is no way to “organize” your screen – so if you buy lots of book/apps you could be scrolling for a while to find the one you are looking for. HUGE plus – this device supports Flash. Why does that matter? You can stream your favorite TV shows from hulu, network channels, etc. The ipad does NOT! Conclusion – If you are mainly looking for a reader, but think you might want to browse the web, check email, stream movies from the Amazon cloud, and maybe have a couple fun apps – this drop-in-your-purse device is going to be your new favorite “toy”! And at only $199 it is affordable too! This device is definitely more expensive (2x+) as the Kindle Fire. But…..there is a reason – it can do way more and is much “beefier.” So do you need all that? You decide! The screen is big! If you just read the specs you might think the 9.5” wide screen is only slightly larger than the 7” Kindle Fire, but you need to factor in the height too. The Ipad It is actually 2x bigger than the Fire! That wasn’t a make or break feature for us – but it sure is nice! The Ipad, although not expandable, does have various storage sizes to choose from when purchasing it (16, 32, 64GB) – at minimum capacity it is still 2x bigger than the Kindle Fire. In comparing specs is is also 1/2 the weight. I will mention though, that although I like how lightweight it is – I did find it easier to hold and browse using the Kindle Fire. The added “girth” made it more comfortable for me to hold. The Ipad is really an amazing device – the image quality itself is stunning! The colors are vibrant, the touch-screen works effortlessly, and it was very well designed. 5gb camera that takes pictures on either front or back of the device. I honestly don’t foresee using this much. After all this device is pretty large to stick in a purse! But it is handy to take a picture of the kids to insert into a story or to play a version of hide-and-seek my creative sister came up with! I can also see parents who travel using this to Skype with their kids! Battery life –The official specs say up to 10 hours of battery life. My hubby and I tried the devices out side by side and I got 15 hours out of the Ipad. 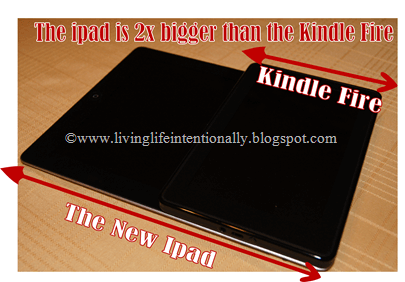 The Kindle Fire got 1/2 that. I will note that the cord for charging the Ipad is short and does limit your charging options. There are various docking stations available (including speaker ones) that might be a worthwhile addition. With the large screen reading children’s books on the Ipad is GREAT! Your kids will still see large illustrations. The down side is there are still relatively few picture books out there. Don’t get me wrong – there are lots of books and they are adding more all the time, but it will NOT replace paper books any time soon. Also, as noted above, I found there were fewer book selections for the Ipad than the Kindle Fire. 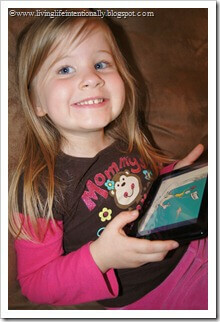 Yes there is an app for that too – the Kindle app allows you to read Amazon Kindle books on your Ipad. However, they are not formatted for the Ipad – you WILL notice in children’s books especially that the pictures aren’t lined up right (i.e. not on the same page) and are usually small and hard to see. You can also get lots of classic, out of print books free (for either device). 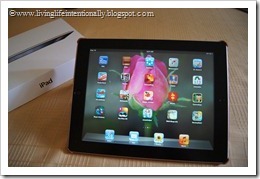 Syncing – My hubby was thrilled that the Ipad would allow you to sync all your devices (i.e. contacts). The Kindle Fire does not seem to have it built in. Streaming Movies – You can upload your own or buy from iTunes and stream from the cloud (but that can get pricey!) But one thing I wanted to mention that was very disappointing to me is that you CANNOT stream anything needing a flash plugin. As a non-mac user this is new to me. So what does that mean? If you are wanting to stream free television from your Ipad (think network sites or Hulu) – you can’t! They all require flash!! ERGH! I was very disappointed with Apple when I realized this! 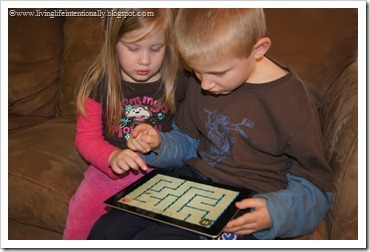 Not quite enough to ditch the Ipad……but honestly pretty close! Another thing I like on the Ipad is the option to “organize’ your desk top. I can find things quicker by putting all my math apps in a folder, books in another, etc. Conclusion – if you have the money ($499+) to spend and are looking for a device that does everything really well (minus streaming TV – yep I’m bitter about that) this is the tablet for you. It is very well made with lots of “bells and whistles.” You will be thrilled with the variety of educational apps available. I am hopeful that this device will help lower our homeschool text book cost & having to store so many down the road (see Apple & Education). But for now it has great apps, I can read good books, browse the web, and a host of other things. They are both wonderful inventions that will be a welcome addition to any home! Both have clear screens, vibrant colors, crisp sound, many apps, unique features, and are easy to set-up. Which device you choose may come down to price or primary purpose. If you are primarily looking for an excellent reader at an affordable price that has some extra features and great library the Fire is a great choice. If you are looking for a device that is “beefy” enough to almost take the place of a laptop with touch screen function and educational apps up to wazo you may want to spring for the Ipad. 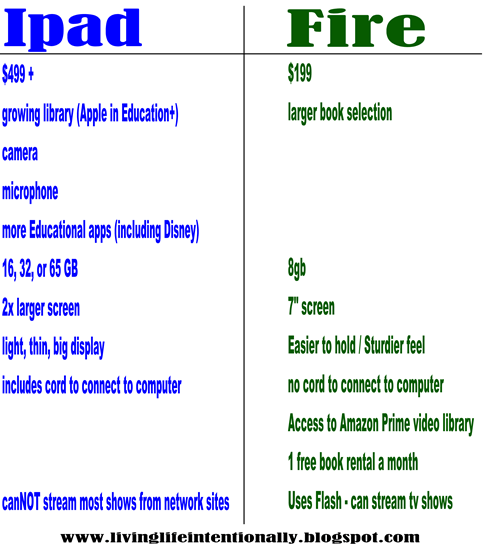 If you are still unsure, here are Kindle Fire Specs and Apple Ipad specs. Or take a look at this simple comparison chart I put together below. Have additional questions – I am no expert, but if I can answer it –I’d be happy to =-) Do you own one of these devices and have something you’d like to add – feel free to leave a comment below. If you own an Ipad or are planning on purchasing one make sure to check out my ongoing series starting tomorrow – +5 Ipad Apps You’ll Love with some of my favorite Ipad goodies!